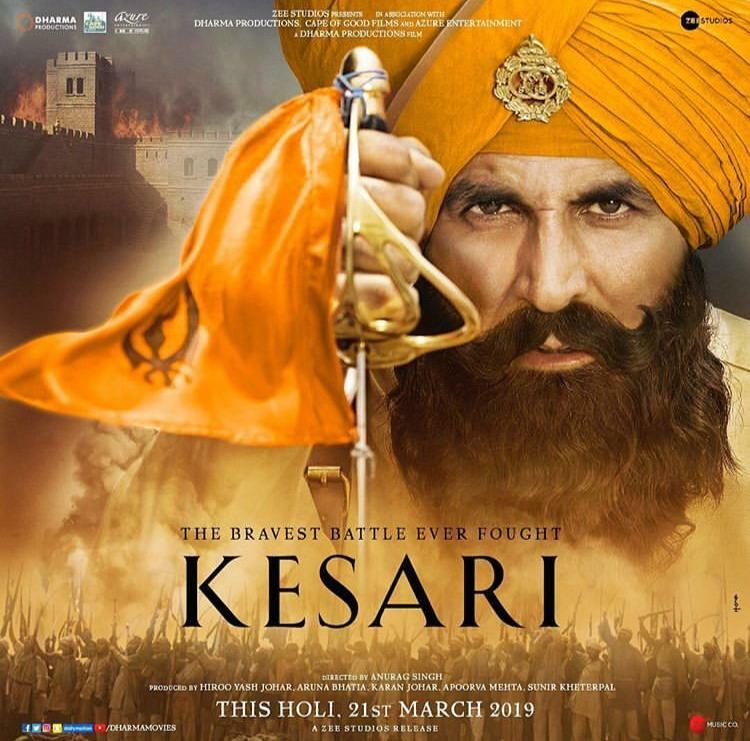 The movie is based on the battle of Saragarhi fought in 1897 , in which only 21 sikh soldiers of the 36th sikh regiment from British indian army chose to fight more than 10000 invading pathan tribals in defence of the fort they guarded . All 21 sikh soldiers died defending the fort , killing hundreds of marauding pathan irregulars before they were overrun . Akshay Kumar plays hawildar Ishar Singh , who is commandant of the fort . He has been sent there because he disobeyed a direct order by his superior British officer to not interfere in the beheading of a pathan woman who was going to be killed because she had left her husband with whom she had been forcibly married . Ishar Singh saves the woman from being punished by the pathan tribal laws and angers the religious leader of the pathans . He declares jehad to avenge the insult to his authority . The whole situation regarding the pathan woman seems to be fictitious and not recorded history ; it seems to have been added to add colour to the story in an act of cinematic liberty . Ishar Singh has been repeatedly insulted by his superior British officer that Indians are slaves because they are weak , so when the pathans attack the fort he claims to his soldiers that he has orders to evacuate the fort . They all refuse this as an insult to their profession , and choose to fight . This liberates them from British yoke in his eyes , for they have chosen to disobey orders . He then dons the kesari ( saffron ) turban signalling his steely will to sacrifice his life and prepares to fight . Before all this he has to discipline the men when he newly arrives to take command , because they are a disorderly bunch . This leads to some comic situations and some laughs . Ishar fondly remembers his wife ( Parineeti Chopra ) again and again as he is doing his job and there are some imagined moments of tenderness between them . Needless to say , all this is cinematic liberty taken by the director to add a touch of patriotism and romance to the situation . Luckily the kesari ( saffron ) turban is donned by a sikh in this case ; if it had been donned by a hindu the whole liberal/leftist lobby would have been up in arms against the movie !!!!! The actual battle is well shown in the movie . The religious leader of pathans kills the woman who had brought on the confrontation by his sword in full view of the Sikhs . Hordes of pathans waving their flags and chanting their war cries attack the fort of saragarhi . They honk their war horns and beat their war drums . In response Ishar Singh beats his own drum and the Sikhs cry their own war cry---'Jo bole so Nihaal , Sat Sri Akal !!' They clash with rifles and guns and explosives till the final reckoning by hand to hand combat . When the sikh soldiers have finally laid down their lives taking scores of pathans with them , you do feel real emotion . The movie has only one or two songs , which are good . Overall background music is good and so is photography . The colours are stark due to the stark landscape of the rugged north west frontier province . Acting is decent by everyone . I am a bit of history buff. The battle of Saragadh is one of my favorite battles in history. I went to see the film specially because of that. The battle is really well shown. However, why do our filmmakers screw up the historic plot? Unnecessarily the British are shown calling Indians cowards. Some unnecessary patriotism is shown. They never show the subtleties of the situation. The movie is good - must watch type, but I was peeved about unnecessary twists. Believe there is a show "21" something on Netflix, the premise of which is the same as what Ashtuktuk pai describes above. 21 sikhs against 1000 other people. So, probably based on the same event. And Shrignraja pai, talking about twisting the plots, you should have seen Ashoka. Saala plot twist ka baat hi choddh... poora history hi twist kar diya Have never seen a worst presentation of a historic event. LOL, you have a different sense of humour Shring. I see movies which I think will turn out to be good . Why should I see movies which I think will turn out to be bad . No one pays for my reviews . Thanks for making me laugh sgars!! I saw the movie a couple of days ago. I like most patriotic movies, and I liked this one too, more so because I had no knowledge about this battle and I got to learn something new. Sadly, our history books were filled with aurangzeb, babar and other mughal assholes; I wish there was a detailed chapter or two about such battles in addition to brief mentions of 1857 revolt, Mangal Pandey, Jhansi Ki Rani, Shivaji, Maharana Pratap. Wrong . The brave men are Sikhs and they fight pathans , not British . If it were not for Tukaram Omble, things would have been a lot different. One of the greatest feats of bravery by a policeman, for which he was awarded the highest civilian honour, the Ashoka Chakra. Though Sikh bravery is commendable in this war Pashtuns were fighting for their nation and their freedom. They won this battle at a huge cost and subsequently won the war itself, the final settlement was Durand line and is still a point of contentions for Pashtuns across Af-Pak region.